Whether or not you should put on lotion when indoor tanning is a personal choice based on several factors such as why you are tanning in an indoor tanning bed. Before choosing to use an indoor tanning bed, always weigh the pros and cons, consider the risks involved and see your dermatologist regularly. One of the benefits of using tanning lotion in an indoor tanning bed is that it helps the skin stay hydrated. 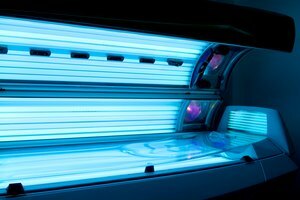 Tanning bed bulbs are very strong and tend to dry out the skin more than the sun because of their intensity. Dryer skin doesn't tan as evenly, so lotion can help you to have a more even tan. Tanning lotions can also speed up the tanning process, unlike sunscreens. According to a study on tanning lotions conducted by the American Tanning Institute, "Indoor tanning products showed a statistically significant enhancement from the baseline for both tan-ability and moisturization." You may also choose to use sunscreen. While sunblock prevents tanning, sunscreen allows you to tan while protecting you from some of the UV rays. If you choose this option, be sure that you use a full-spectrum sunscreen which protects you from UVA rays (the most commonly used UV ray in tanning beds). Some people use tanning beds with UVB rays, for very minimal time limits, to help them get vitamin D if they live at a high altitude where they can't get enough sunlight in the winter. If you are using a tanning bed to get your vitamin D you'll need to skip the tanning lotion since lotions inhibit vitamin D synthesis, according to Dr. Donald W. Miller Jr., M.D. Some people prefer not to use tanning lotions because they're trying to live a more natural lifestyle and tanning lotions often contain synthetic chemicals. For moisturizing, apply a rich vitamin E lotion or vitamin E oil directly after tanning. Using lotion during the tanning process is purely optional, but whether you use lotion while you tan or not, you still need to moisturize or your skin will dry out and begin to tan unevenly. Vitamin E is one of the richest moisturizers and is an antioxidant. It also has the benefit of being natural for those who don't want to use regular lotions with chemical additives. The purpose of lotions when tanning are two-fold: to enhance tanning and to moisturize the skin, which also improves the overall tan appearance. If you aren't interested in using a tanning lotion to speed the tanning process during UV exposure, then any type of lotion applied directly after tanning will keep your skin hydrated.